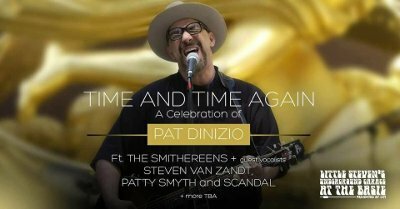 This Saturday night, the Smithereens and a number of guests will be putting on a special tribute to their late lead singer, Pat Dinizio and, now, people around the world can join in with the show being streamed live. Joining the band at the Count Basie Theatre in Red Bank, NJ will be guests like Steven Van Zandt, Patty Smyth, Marshall Crenshaw, Robin Wilson of the Gin Blossoms and many more. The band asked that everyone help spread the word about the show. WE NEED YOUR HELP TO SPREAD THE WORD TO SMITHEREENS FANS AROUND THE U.S. AND THE WORLD WHO ARE NOT ON FACEBOOK AND DON'T KNOW ABOUT THE LIVE STREAM! Email your friends. Post on other social media. Pick up the phone and call! The live stream from the Count Basie Theatre in Red Bank, NJ, will begin at 8PM EST / 5PM PST at THEBASIE.ORG. Online viewers will be encouraged to contribute to the Pat DiNizio Musical Performance Scholarship. Steven Van Zandt, Patty Smyth of Scandal, Marshall Crenshaw, Robin Wilson of the Gin Blossoms, Freedy Johnston, Richard Barone of The Bongos, Bebe Buell, Peter Zaremba of The Fleshtones, Keith Streng of The Fleshtones, The Grip Weeds, Graham Maby, Kenny Margolis, Soraia, Ted Leo, Ed Stasium, Andy Burton, Kenny Howes, Jim Monaghan, and more! Doors for the live event are 7PM, Patty Smyth & Scandal 8PM, The Smithereens with Special Guests 9PM - ? THANK YOU FOR HELPING SPREAD THE WORD AND YOUR HELP IN BUILDING A LASTING LEGACY WITH THE PAT DINIZIO MUSICAL PERFORMANCE SCHOLARSHIP! Dinizio died December 12 after over two years of declining health due to two falls. He was 62.